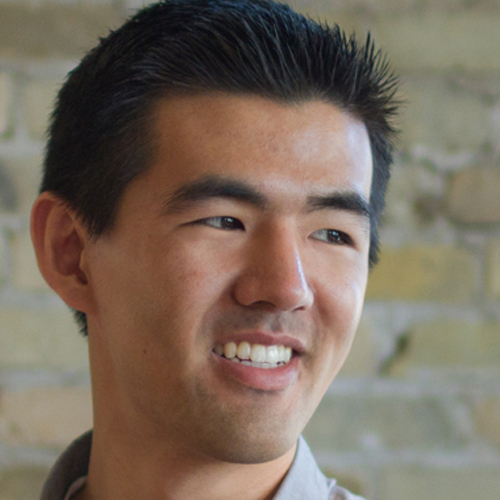 Jon Hainstock (@jonhainstock) is co-founder of Zoomshift, an Online Employee Scheduling Software company. A couple weeks ago I had the opportunity to grab lunch with both Jon and co-founder Ben Bartling (@benbartling). As a startup with a limited budget they have strategically used SEO and Inbound Marketing to build their traffic and more importantly drive leads and customers. They have a great product and story, hope you enjoy!! Q: What is Zoomshift, who is it for? 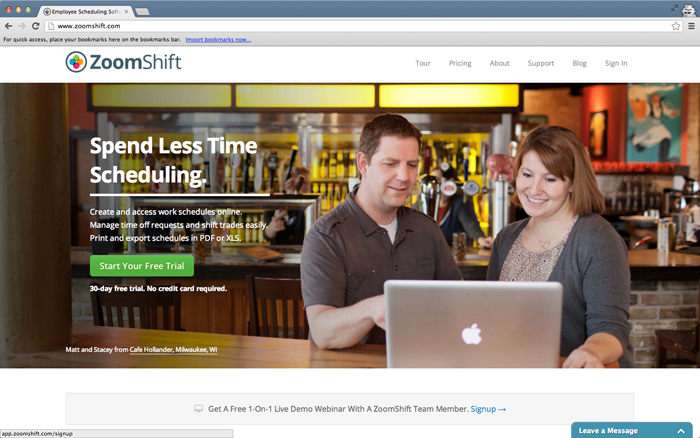 A: ZoomShift is simple employee scheduling software for small businesses. We really focus on solving the scheduling problem for businesses with under 100 employees. Q: What marketing/advertising have you done in the past? A: We’ve tried cold calling, direct mail, Facebook ads, Google AdWords, PR and SEO to try to build awareness and increase leads. Q: What marketing initiatives have worked the best? A: SEO has been the best marketing channel for us. Interruption (outbound) marketing wasn’t working well for us, mostly because business owners were not ready to change their scheduling process, even if it was terrible. When someone is actively searching for a solution, they are usually fed up with their process, and are ready to try something new. Q: How does content marketing play a role in your daily activities? A: We spend a lot of time interacting with customers everyday via support and chat, and we are able to build better content based on their feedback. Our initial goals were to climb the SERP’s for a handful of keywords, but now we are really focusing on using the language of our customers to build better content. Blogging gives us the ability to build trust and provide fresh insights on how small businesses can streamline their processes. We are also tweaking existing content and building new pages on a daily basis to test if they will be valuable for our SEO campaign. Q: What tools do you use for your inbound marketing/seo efforts? A: We use Juxseo, an on-page SEO grader, to optimize the content on our site. We have also used Scribe to make sure our content is valuable and readable for our target market. We use Positionly to track rankings on a day to day basis. We track domain authority and trust with Moz’s tools. Q: What are the results so far? A: We are always amazed at how well SEO works. While SEO is only one arm of the inbound game, it brings in over 60 signups every week, and converts into around 3-5 paid customers per week, all on it’s own. Some of these conversions had assists from social interactions or referrals, but a majority of them convert from a keyword. Q: What advice would you give to help others with their SEO strategy? A: Go for the low hanging fruit. Start by doing a lot of keyword research, using the Google Adwords Keyword Tool, Google Suggestions, and Übersuggest to give you keyword ideas. Then find the keywords with the most search volume, highest buying intent and the lowest competition. Use those keywords as the main pages of your site and as categories for your blog. About the Author: Steve James is a partner at Stream Creative, a certified HubSpot partner and full service digital marketing agency specializing in inbound marketing, web design and development, and social media. 1. The most important thing you need to do to drive traffic to your website from LinkedIn is to (duh) actually put your company's URL in your profile. Very few people actually do this. When you put the link in your profile, don't use your company name. Use a phrase that someone might search for. For Hive411, I use online networking as the link text. For Hubspot, I use internet marketing software. If you are a residential contractor in Worcester MA with a specialty in kitchen remodeling, put "Kitchen remodeling contractor Worcester MA" as your link text. These links will send you traffic directly from linkedin. It'll also help you rank higher in search engines for the keywords that you use. 2. The second most important thing for you to do is invite all of your trusted contacts to connect with you. I currently have 298 connections on there. I wouldn't say that I trust them all. But, I usually don't decline a connection request. Therefore, over the years, I've accumulated what I call a nice "LinkedIn Baseball Card Collection". The only down side to a big collection is that I have to deny connection requests sometimes if I don't know the parties involved. 3. Now that you have connections, it's time to use LinkedIn. This one is counterintuitive, but it's the most important one. Don't ask people to send a request to connect. I rarely ask someone to connect me with someone else. Why? The first reason is that I don't need to: I can pretty much help anyone generate leads online for their business and have plenty of people that want to talk to me, so I rarely go out and solicit. Also, it's difficult to initiate a sales call with a relative stranger without asking an open ended or blabbing about the features and benefits of your product. How often would you forward that stuff to a friend if you don't know they are in the market for it? Exactly. That's SNAM. 4. So, instead of focussing on connecting directly with prospects, I work on increasing my visibility in the LinkedIn network. The easiest way to do that is to endorse people you know. So, once you invite your trusted contacts (#2 above), go and endorse their work. Almost every time that I've done this, people have reciprocated by endorsing me. How does this help you drive traffic? Your name shows up prominently on their profile with a link to your profile. And of course, since you put your URL (#1) on your profile, some people will click through and visit your website. 5. So, now you have your website linked, you've connected with all the people you know and you have some endorsements that tell people that you do great work. You're now ready to start reaching out to prospects. The best way to do that on LinkedIn is by answering questions. LinkedIn has a very cool tool that allows anyone to post a question. They are categorized and searchable. I recommend you go and find questions that people are asking that you can answer with some expert advice. You should answer it an unbiased and non promotional way. If your answer is good, you'll be demonstrating that you are an expert. There's a big chance that the person asking the question may need your service and will contact you. Further, since the question is archived, it can be found on linkedin, (and if it is a public question), in search engines. Here's the most important part, though. When you answer the question, at the bottom of the answer, you can put your URL. It's masked, so it won't help your search engine rankings. But, the question and answer will be indexed and anyone that reads your answer and wants to meet you, can then click through.